At my new project I am responsible for configuration management. We are using Visual Studio 2010 Premium and Team Foundation Server 2010 (TFS). The app we are going to build is an ASP.NET MVC Web application as the presentation layer that communicates to the data store via a services layer . The data store will be a SQL Server database. For now the service layer is not implemented, because the build is the first thing I do. Because the app is going to be a product that is very important for the organization (core business), I am going to use Continuous Integration (CI), every check-in will result in building of the product and running all our unit-tests. CI is very easy to achieve with TFS. In addition to the unit-testing and building of the product, I want a nightly build where the build also deploys the application to a test web server, deploys the database to a separate test SQL Server and when all these tasks have succeeded run automated web tests on the web application, so the state of the application is always known and the testers will have a report with the test results first thing in the morning. I am aware of Lab Management, which makes these configuration’s easier to manage, but as I mentioned we are using VS Premium for now, so I can not leverage Lab Management at this moment in time. To deploy a web application using Team Build I want to leverage MSDeploy. 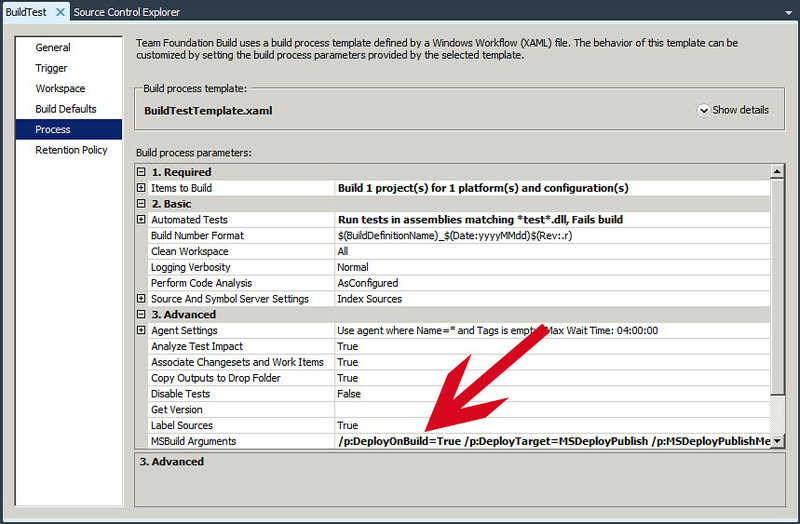 I had to install MSDeploy on the test webserver, the application will be deployed on. The installation and configuration of MSDeploy was not straightforward to say the least. 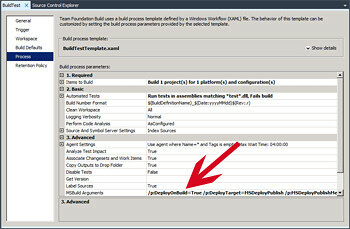 After MSDeploy is working on the webserver, the deployment of web applications using Team Build 2010 is a question of setting the right MSBuild arguments in the new Build settings window of the Build definition feature. MSDeployServiceUrl, because I use RemoteAgent, I could not use https://machinename:8172/msdeploy.axd (msbuild puts http before the url…), I took some time to figure out that the service listens to http://machinename/MSDEPLOYAGENTSERVICE also. .NET Framework 4.0 comes with the web.config transformation feature, a web.config has a shadow file per build type, so a web.debug.config and a web.release.config. When the project is build as a release build, the values of the attributes in the connectionstring are changed to reflect the values in the connectionstring in listing 2. This was all I needed to do to make Team Build deploy my web app to another server, I will report on how I configured Team Build to deploy the database (an vsts database project) in a follow up post.